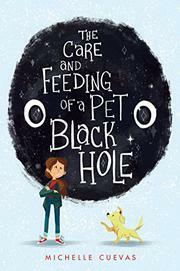 Instead of a lost kitten, 11-year-old Stella “Bug” Rodriguez rescues a black hole she names Larry (“short for Singularity, which I’d read is a place of infinite gravity at the heart of a black hole”). For a lonely, precocious, science-loving girl who idolizes Carl Sagan, nothing could be better—at least, at first. Soon the chaos of the actual black hole forces Stella to confront the metaphorical black hole of sadness left by the death of her father. Her intense grief—equaled only by her fear of confronting it head on—contrasts with the wacky humor of a slightly domesticated black hole that consumes everything, including Stinky Stu, the class hamster, a neighbor’s garden gnomes, and the new family puppy. Stella and her little brother, Cosmo, embark on a surreal journey, printed in white type on a black background, through Larry’s depths in search of the dog, ordering up what they need as if Larry were a cosmic, malfunctioning Siri (“ ‘LAMPS!” we shouted. “NOT STAMPS. LAMPS! SWALLOW LIGHT. LIGHT!” A moment later we saw a kite sail by”). Throughout the book Stella addresses her father directly as “you,” a potent reminder of the fresh intensity of her loss. Set in 1977, this quirky story is enhanced by charming pen-and-ink illustrations. Aside from Stella’s surname, which suggests the family is Latinx, race and ethnicity are unspecified.